Pretty standard PT type unit. Use it on a turn when you win initiative so that you can close to range 1 or 0 to launch your torps. S Boats need to get to land ASAP… they are safe there. Karlsruhe might be a good idea too. Initiative really helps with units like this. If land isn't available on your given map, consider a T-27 instead. Though I agree with most of the above, in my opinion the S-Boat is a step above the standard torpedo boat. The 2 die on close range gunnery is better; if you end up in the same sector as a battleship you're trying to torpedo, you have a realistic shot at damaging an escorting destroyer with gunfire. 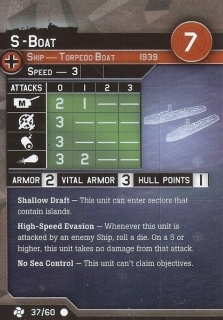 But what's a big standout over the other torpedo boats is the S-Boat's 2 armor; unlike other PTs, an S-Boat is not an automatic kill for a strafing fighter or any destroyer that shoots at it. I would probably rather take a Vospers than an S-Boat, but this thing is way better than a Motor Torpedo Boat or a PT Boat.